FREE "Super Why" Play Day at T.R.U.! 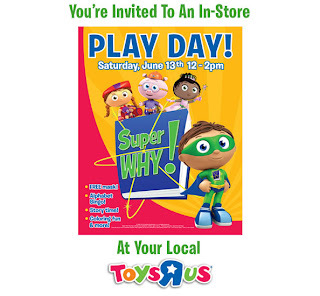 Enjoy a FREE Play Day at Toys R Us with Super Why on Saturday, June 13, from 12pm – 2pm. Activities include Alphabet Bingo, Story Time, Coloring and more. A FREE mask is included. Super Why is intended for children ages 3 and up.